Is There Such A Thing As A Blade That Doesn’t Require Sharpening? Home General Is There Such A Thing As A Blade That Doesn’t Require Sharpening? That’s exactly what I thought when I first stumbled upon the term “self sharpening knives”. For a minute or two I’ll admit I was a little dumbstruck! Sometimes it’s nice to pause for a moment and really appreciate how far we’ve come as a species in literally everything. Over the last couple decades, we’ve made huge advancements in technology, medicine, and even business for that matter. And the result? More innovative products that either simplify an existing issue, or solve problems that were previously insolvable. But do the new ways always trump the old ones? I want you to ponder this for the rest of this post! What are self sharpening knives? Are they over hyped, or legit? We’ll attempt to answer all of these questions in greater detail, but before we do it’s important to understand the basics of knife sharpening. Don’t fret, everything will make sense in the end! I feel it’s important to remind you about the history of how blades were sharpened way back when, versus now. Why? Simply because as a consumer you need to be educated, so you don’t end up buying the next new gimmick or gizmo that does nothing to solve your problem! So when you come across new products such as self sharpening knives (more on this later), you’ll be better able to make an informed decision that serves you best. Using a stone to put an edge on a blade is one of the oldest, reliable, and most proven methods. If you go way back in history, you find some very interesting stories about how people back then used to get their blades sharpened. Cometh the hour, cometh the Moleta! Moleta’s were basically individuals who understood the art of developing a wicked edge. They originated in Italy, and eventually quite a few made the move to America. If your blade ever needed to be sharpened, you’d pay a Moleta to do it for you on his grinding stone. Click here to read more about them. Okay, what about now? How do people go about putting an edge on a blade in the 21st century? In today’s day and age, we are of the mindset that the less work we have to do, the better. 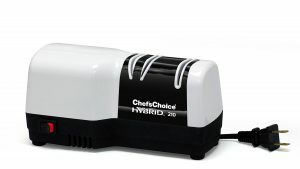 Step forward the electric knife sharpener! This invention makes use of automation and leaves the operator with hardly any guesswork. I’d even go to the extent of saying it is foolproof. The other device which we also use today are the pull through, non-electric variations. Also just as easy to use, these manual styles are cheap, versatile, and portable. Each tool has it’s own benefits and drawbacks. Now that we have a basic idea about knife sharpening, let’s look at self sharpening knives! Self Sharpening Knives – What Are They? Finally, we get into the crux of this post! Very soon you’ll see why everything I mention above is relevant and important. 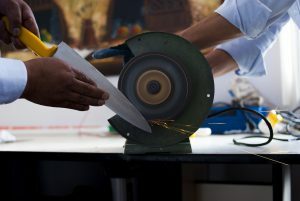 When I first heard the term “self sharpening knives”, I immediately thought of a blade whose cutting edge never dulls. I know, how silly of me right!? It’s only when I read more about these types of blades, and watched videos, did I realize how wrong I was. 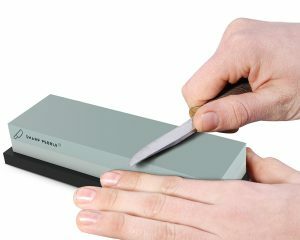 Self sharpening knives are basically knives which come with a built in sharpener of some sort, usually in the block set or sheath. To get a better understanding, let’s take a look at the popular Calphalon block set with SharpIN technology. 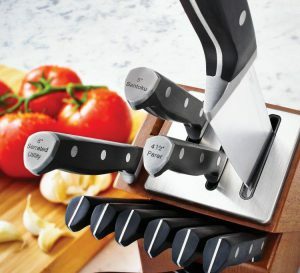 A Review Of Calphalon’s Self Sharpening Knife Block Set! Look at the image below. What do you notice? Does this not look incredibly similar to something we already talked about earlier in the post? It’s a PULL THROUGH style! Every time you draw or place a knife into the block, a little bit of steel is removed and your blade sharpened. What do you think of the idea of having sharpener inserts built into block sets? Genius and brilliant, or lazy and ineffective? Keep reading to see what I think! 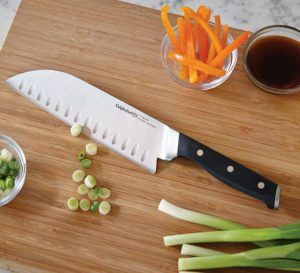 I’ve always been a huge fan of Calphalon knives. Not only are they great to handle, but the workmanship is top notch considering how much you pay compared to the competition. If you’re in the market for a knife set, this is one i’d strongly recommend. What all is included? 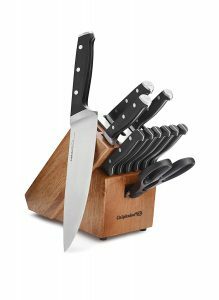 If you go with the 12 piece set, you get an 8 inch chef’s knife, a 5 inch santoku, a 4.5 inch parer, a 6 inch serrated utility knife, 6 steak knives, a pair of kitchen shears, and a solid wooden block to store them all! All of the knives included in this set have a full tang design. For those who don’t know what that means, a full tang design is one where the knife is just one solid forged piece of steel. Because you’re dealing with a single forged piece of steel, the knife is more durable and solid. Full tangs also have a good balance to them. Love That Full Tang Design! What the lifetime warranty gives you is peace of mind. You can read more about it on Calphalon’s website by clicking here. The base of the knives are labelled so you know exactly what you’re picking out from the block. The only knives that aren’t labelled are the steak knives. I should say it wouldn’t bother me if the knives weren’t labelled at all, but having them labelled is definitely a nice touch! Every time you draw a blade, you remove metal. It’s as simple as that. Here’s a question I’d like you to consider: Do you think it is necessary to be sharpening your blade before every use? The answer is no, absolutely not! Why not? Because the goal isn’t to simply remove as much steel as you can! You see most of the time your blade doesn’t even require sharpening, but only realignment of the edge. You can realign your edge by frequently honing using a steel. Honing your blade is something you should do before every use. Not sure what honing is? I wrote an entire post discussing why it is so important. Click here to read it. What About All The Metal Shavings? Steel dust tends to collect on the edge of a blade as it is being sharpened (remember, steel is being removed). Next time you sharpen your blade, run your finger carefully along the edge and notice how your finger collects steel shavings. Now, imagine this happening each time you draw your blade from the block….It’s not ideal because you have to remember to thoroughly rinse a blade each time before using for food prep. I am not saying this is a big deal, but its worth mentioning. Love the knives, but not so much the self sharpening aspect. 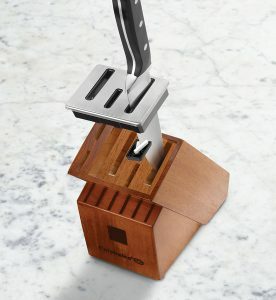 In a nutshell, that sums up how I feel about this 12 piece self sharpening knife set by Calphalon. All things considered, it’s still a decent buy given the full tang design, lifetime warranty, and solid blonde rubber wood block. Are Self Sharpening Knives Over Hyped Or Legit? The million dollar question. Self sharpening knives in my honest opinion are a little over hyped. While they may restore some bite back to your edge, they never properly and completely sharpen them, at least not the way a sharpener would. That being said, you’d still need to sharpen these knives as you would any other (albeit at a reduced frequency). Think You Can Get Away From Sharpening? Think Again! If you’re buying them just for the self sharpening aspect, probably not. If you’re looking at buying a knife set, there’s a lot of things you should consider. Things like weight, steel quality and hardness, feel, handle comfort. Maybe i’ll write a blog post about this in the near future! A Quick Note Before We End! I strive to provide you with unbiased reviews here at myelectricknifesharpener and you’ll notice that almost every product I review has some shortcomings or disadvantages to it. I don’t hide the truth. It’s especially easy to become misguided when you have products that are so well marketed. Having said that, I still do think there are some cool innovative products that continue to surprise me. Self sharpening knives so far have failed to pique my interest, but the design deserves some credit for at least attempting to do things differently. If there’s one thing you should take away from this post, it should be this: Take the time to understand the pros and cons of whatever it is you’re thinking about purchasing. Are you willing to accept whatever cons there may be? Does the product suit your needs, and will it solve your specific problem? I HOPE THIS POST HAS PROVIDED YOU SOME INSIGHT ON SELF SHARPENING KNIVES. IF IT HAS, WHY NOT SHARE TO YOUR SOCIAL NETWORKS! IF YOU HAVE ANY QUESTIONS OR COMMENTS, PLEASE LEAVE THEM BELOW. THANKS FOR READING!